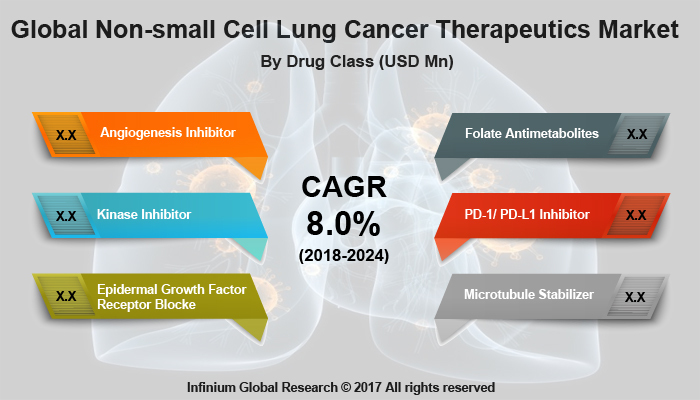 A recent report published by Infinium Global Research on non-small cell lung cancer therapeutics market provides in depth analysis of segments and sub-segments in global as well as regional non-small cell lung cancer therapeutics market. The study also highlights the impact of drivers, restraints and macro indicators on the global and regional non-small cell lung cancer therapeutics market over the short term as well as long term. The report is a comprehensive presentation of trends, forecast and dollar values of global non-small cell lung cancer therapeutics market. According to report the global non-small cell lung cancer therapeutics market is projected to grow at a CAGR of 8% over the forecast period of 2018-2024. The non-small cell lung cancer is a type of lung cancer arising in the epithelial tissue, and it is different than the small cell lung cancer. This non-small cell lung cancer is the most common lung cancer among the all types of lung cancers. Most often, treatment for NSCLC uses a combination of 2 chemo drugs. Studies have shown that adding a third chemo drug doesn’t add much benefit and is likely to cause more side effects. The report defines the market of non-small cell lung cancer on the basis of the treatment types including Early/non-metastatic NSCLC, Advanced/metastatic NSCLC, EGFR mutations, ALK gene rearrangements, and other treatment options. The report provides deep insights on demand forecasts, market trends and micro and macro indicators. In addition, this report provides insights on the factors that are driving and restraining the global non-small cell lung cancer therapeutics market. Moreover, IGR-Growth Matrix analysis given in the report brings an insight on the investment areas that existing or new market players can consider. The report provides insights into the market using analytical tools such as Porter's five forces analysis and DRO analysis of non-small cell lung cancer therapeutics market. Moreover, the study highlights current market trends and provides forecast from 2018-2024. We also have highlighted future trends in the non-small cell lung cancer therapeutics market that will impact the demand during the forecast period. Moreover, the competitive analysis given in each regional market brings an insight on the market share of the leading players. This report will help manufacturers, suppliers and distributors of the non-small cell lung cancer therapeutics market to understand the present and future trends in this market and formulate their strategies accordingly.